Has the Atlantic Yards project become far less ambitious? 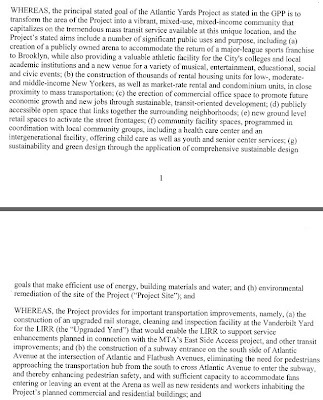 There are some curious and telling differences between two documents that describe the goals of the project, one issued by the Empire State Development Corporation (ESDC) in December 2006 and the other by the Metropolitan Transportation Authority (MTA) after the board voted on Wednesday to approve a revised Vanderbilt Yard sale with more generous terms for developer Forest City Ratner. 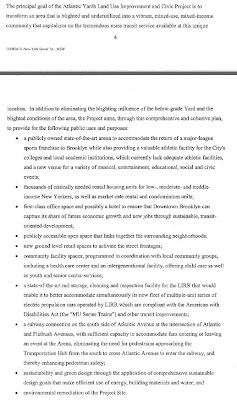 Even though the language is nearly the same, the MTA board resolution--not read aloud or made public before the vote--does not mention the removal of blight, perhaps because government officials recognize that persistent empty lots for "decades" might constitute the exacerbation of blight. The housing is no longer described as "critically needed," perhaps because it could take "decades," and the State Funding Agreement imposes no deadline for Phase 2. The promised office space is no longer even "first-class." And there'd no longer be a hotel. There are some other changes as well. Does any of this have legal import? I'm not sure, but it does suggest that the estimated benefits of the project--always open to question--have diminished. The excerpt below and right comes from the ESDC's Modified General Project Plan (GPP). I've bolded language that does not appear in the MTA document. • environmental remediation of the Project Site. The excerpt below and right comes from the MTA Resolution approved Wednesday by the board. I've bolded new language and use  to indicate where language has been dropped.